I'm brand new here, just starting to think about building a boat (or two or three) for myself. I do have some woodworking experience and I'm an engineer so working with blueprints and drawings is pretty easy for me. For my first attempt, I'm really leaning towards building the 14' canoe that's available under the free plans. I've downloaded them, read through them several times, I've gone through most of the FAQs and tutorials available here and other websites around the Internet. I'm thinking about the canoe as a first build because it appears pretty simple and I know it will be quite useful with my family. I ultimately think I'll build the GP21 Bass Boat or maybe something bigger, but with no epoxy and fiberglassing experience, I wanted to start with something that i would be too devastated to mess up on. That all said, here are a few general questions I have about the process, tools, and materials. 1. I understand that Wood flour is used to mix with epoxy to create a putty for making the fillets at the seams joining to pieces of wood together. 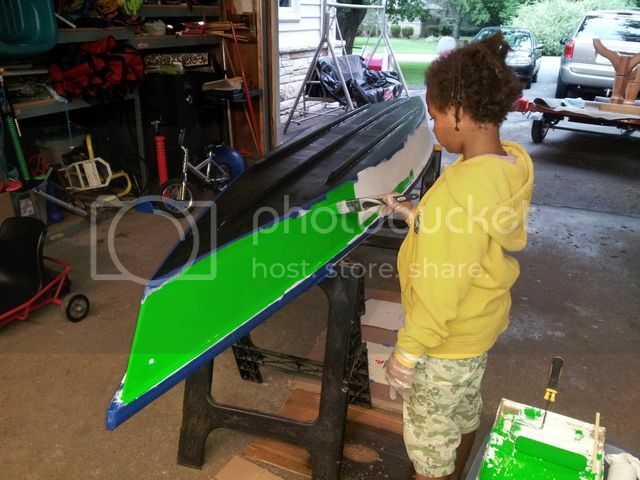 On boatbuildercentral.com, I saw the SilverTip kit and wanted to know if would be wiser for a first timer like me to use a putty kit like that vs buying the epoxy and wood flour separately? Am I more likely to waste more of material as a first timer where buying separately would give a little more spare than buying it in a kit? 2. For the canoe specifically, I saw that the fiberglass tape is called for along all the seams. In one of the tutorials, I noticed that the small boat they were using, they also put a layer (or two) of fiberglass cloth over the outer hull. Would this add some structural strength to the canoe? (I'm a bigger guy myself so I want something that is pretty strong). 3. I was also thinking of incorporating a couple of small bench seats in the canoe (much like you'd find in a commercially bought canoe), just to take some of the stress of my knees. Are the any guidelines to follow when placing these benches? I was thinking one centered and then one more in front and back about half again. 4. Any tips on tools or shop setup to put a boat together? I have a large detached garage that will be the primary workspace. I'm planning to get a few more tools like a small circular saw (a 4 1/2" instead of my bigger 7 1/2"), a second sander, some more handtools and clamps and the like. Are there any must haves that I've overlooked or might not think about as a newcomer to this hobby? I can not tell you about the benches but one of the experts will chime in I am sure. As for making glue it is quick and easy to use the premixed stuff but making your own is no big deal. After making one or two batches you will think so too. One tool many of us just love is a multi-tool. The one made by SonicCrafter is used by many builders. They are great for small tight cuts and sanding in tight places. I liked mine so much I ended up buying two so I did not have to switch back and forth. Buy lots of clamps you never have enough . The free canoe has been enjoyed by many builders. With such canoes, the lower you can keep your center of gravity, the better -- with apologies to the knees. Let me ask this: if you were to go with something other than a canoe, in order to be more kind to your knees, what other type of small *starter* boat would it be? Then ask your knees for more input for the decision. If you will pass along the canoe to someone else after you've seen how easy it is to succeed, such that your knees have less of a weighted voice in the decision, then get started! In other words, since it sounds like this would only be a starter boat and not the final ideal boat, maybe give us a little more information about your vision for *the next boat*. The free canoe is a very valid and enjoyable experience, but do not let the *free* make that decision. You will put time and money for materials into any build. Give your preference for boat (rather than cost of plans) room in the first decision, recognizing it still may be the free canoe. It is likely that you will use more materials than necessary when first developing skills and getting a feel for the materials. If you buy a kit, mentally be ready to have to buy a little more, of everything, to finish up. It is realistic on a first project. ANd on the free canoe, is not the major financial investment it might be with other boats. If you are using good plywood (tell us your plans for wood), then these designs are strong, but then, how big are you? Is a small canoe the best choice for your... dimensions/center of gravity? It is a good question worth asking. With glass on the outside of the hull, it will endure better when dragging it on a beach or across rocks, but it will weigh more. lots of glass may make it not practical to car top. So tell us more about planned *payload*, and how you plan to get it from the yard to the water. The chine seams and the rubrail give this canoe much of its *shape strength*. I don't know that a layer of 6 oz cloth over the entire outside would add much more *strength*, but it will add abrasion resistance, and weight. I'd add it for the rougher treatment aspect, but have a plan for trailering without having to lift it onto a car top. And again, are there long term plans for this first boat, or, do you just want to see that *you can do it*, and have some fun before the larger investment in the ideal boat? Although I haven't built that boat, I've been in larger canoes, more stable canoes, and there are days when we certainly chose to sit on the floor instead of the *seats*, for stability and safety. I suspect it would have a large effect to sit on a very raised bench seat in this free canoe, an unpleasant effect. maybe other builders will jump in with their experience with this boat. ? You'll build *your* tool inventory as you find it conveniently necessary (and of course we all define that differently ). For the free canoe, you may get away with nothing more than a jigsaw and some tie wraps and PVC clamps, and an RO sander. I burned out my first CHEAP jigsaw. Then bought a DeWalt and was amazed by what a real jigsaw was, and could do. I also bought a small Makita portable circular saw, on Justin's recommendation (when he built Just Right). It was a good recommendation. I like it, even though it doesn't last too long on one charge. Very handy for cutting smoother curves in plywood that I can not do as easily with a jigsaw. Then.... the tool madness will get a grip on you, or is that the clamp madness? My Dremel is still going strong on many projects, but then I have many projects. I recommend you buy an entire BOX of cheap chip brushes from a place like Harbor Freight. They will be half the cost of the local big box store, and are good enough after you pull out any loose bristles. I bought one inch and two inch brushes, bulk. No regerts! And buy a big box of tongue depressors (hobby/craft sticks?) from a place like Michael's or Hobby Lobby, cheap. Grind or cut one end flat. I reuse each about twenty times or more, but with a couple hundred ready to go, and cheap, the build can have less time of cleaning up disposables for reuse. Same with mixing cups. I use clear plastic now. Used to use *coffee cup* hot drink quality paper cups, and might again for larger batches and laminations. Don't use cold drink paper because they have way too much soft wax on them that can contaminate the epoxy batch. The hot drink paper cups are much better, or plastic, the thicker hard clear plastic. Thin flexy plastic, like for small bathroom cups, will melt. Test first of course. Styrofoam cups will likely melt also, chemically. I use lots of paper towels. I tear them in half, to use less with just as much cleanup value. You'll develop your own preferences as you learn, and then you can answer the next post like this, while I'm out sailing or fishing or otherwise bouncing over and through chop. btw, it is very handy to be able to have some control over the environment in the build area... a good shop vac ... heat or AC. Good ventilation when working with the epoxy. Epoxy does not have the toxic stink of polyester resin's styrene, but there is a smell, that some barely sense, while others find it very obvious. And some people can develop an allergy to epoxy after long term exposure. So it is wise to ventilate the work area at least while working in there. You don't want to find out that you are one of the people who will develop an allergy -- by developing an allergy. Work clean and ventilate the area. Simple. I use a good vapor cartridge respirator when doing large laminations, but just work in a well ventilated area for small jobs. Without the respirator, on big jobs, I get the deep lung hack and sinus headache. Respirator is the fix. Simple. Work smart and enjoy working smart. Boat building is a blast. Post pictures. Thanks for the feedback everyone. All of it is useful information as I'm just getting into this. To answer a few of the questions that you all asked and give a little more information. The Canoe will be a simple, fairly quick first build. A test of my skill, patience, and abilities. Something fairly inexpensive to test my ability to cut the wood, work the fiberglass, and in general complete a build on something of this scale. I currently own an aluminum fishing boat and a commercial kayak that I use as much as possible but not nearly as much as I'd like. This canoe is something that the rest of my family will get use out of with me. Where we live in Southwestern PA, we're near several rivers where it's nice to just get out for an afternoon of paddling. So despite this canoe being my potential first build, it's still something that I fully intend to use for some time, not just as a building template. I'm planning to get Okoume marine plywood to build this canoe. I'm the type of person that goes by the old go big or go home motto. I figure if I'm going to risk screwing something like this up, I might as well risk screwing up something high quality. As for my 'dream build' I'd love to build a larger sailing yacht, but from a practicality standpoint, that just doesn't make a lot of sense. Sailboats on the rivers here aren't going to be of any use and hauling something that size I'd ideally be looking for (probably 35' plus) wouldn't be feasible either. So I figure I'll scale back the whole ideal dream boat and look at something on the order of the GP21 Bass Boat. Something that I can use on the rivers but still plenty big enough to carry myself, my wife, and a couple of the kids out fishing. I'm an electrical engineer that works in industrial construction. Reading drawings isn't a big deal for me. 'Despite having the electrical background, my job generally requires me to have a pretty good knowledge of mechanics, hydraulics, pneumatics, etc. Pretty much a jack of all trades. Hope that helps answer some of those miscellaneous questions. 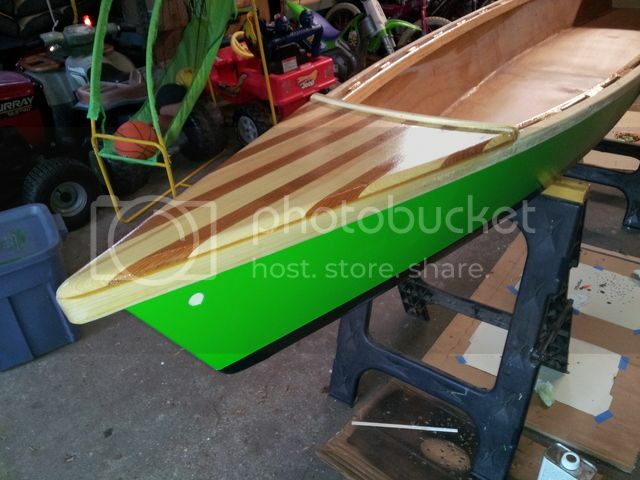 You might also want to take a look at Capeman's SC16 build that he just began.... a smaller boat being built by an experienced builder, with a goal at light weight. You might find it helpful, along with lots of other builds in progress, or already finished. Enjoy. I'll second that about keeping the seats low. It's not a big wide boat like commercial plastic kayaks. I prefer sitting on a thin foam cushion on the floor, and using a 2 bladed kayak paddle. The flip side to the narrow beam is that you can get going pretty fast in one of these with little paddling effort. If you are considering sheathing both sides with fiberglass cloth, I would encourage you to use a very light cloth like 4 oz, and you can use 4mm Okume rather than 6mm. You'll end up with a very strong and light boat. 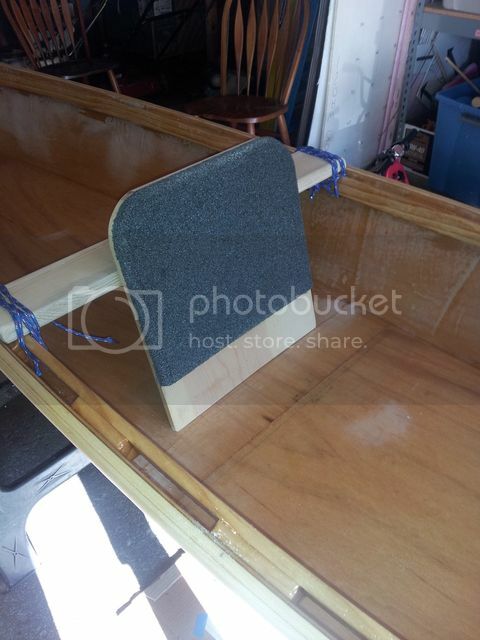 This is my daughter's boat, made of 2.5mm plywood with 4oz cloth. I scaled it down to 80% because she's light, but it feels plenty strong with me on board (dang tippy though and with little freeboard, that would be better if made normal size- I'm nearly double the design load for this size). The rubrails and slotted inner rails add a lot to the stiffness, as do the runners on the bottom. I'd consider both of those if you are a bigger guy. Last edited by Fred in Wisc on Wed May 18, 2016 4:45 pm, edited 2 times in total. Runners on the bottom. This really stiffened up the bottom a lot. Also it's great practice since you'll likely have to install them on a bigger boat. The runners are approx. 3/4" high, with a tip of about 1/4 and base of about 5/8 or so wide, tip sanded round so the glass cloth would wrap it without gaps. The graphite bottom coating works great and is easy to apply. And it's a lot more comfortable paddling with a back rest.